Brandon Aly is an accomplished clinician for small school band programs, both battery (drumline) and front ensemble (pit percussion, mallets, accessories, and the like). Brandon also provides writing and cadence arrangement services, along with halftime show music. 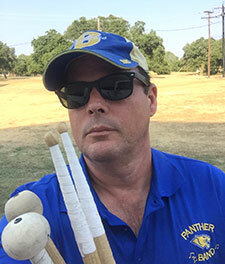 Brandon’s many years serving as director of percussion at Blanco High School, in Blanco, Texas, has given him great insight into the challenges and possibilities surrounding small bands and percussion units. Let Brandon bring this experience to work for your own high school. Brandon specializes in helping small high schools achieve their maximum potential. He can provide your organization with arrangements that are custom-tailored to the skills and capabilities of your unit. If you’re a band director in search of these types of services, contact Brandon Aly today. Interested in learning more about drumline consulting for your small- to medium-sized high school unit? Brandon Aly welcomes your inquiry and looks forward to working with you on all your arrangements. For fastest service, use this contact form to reach Brandon. Please include any information you feel is important to convey at this time. Brandon endeavors to reply to email inquiries within 24 hours, but given his varied schedule, responses may take longer at any given time. Thank you for your interest in drumline consulting with Brandon Aly. COPYRIGHT 2017 BRANDON ALY. ALL RIGHTS RESERVED. SELECT PHOTOGRAPHS COPYRIGHT © JONATHAN D. HOLLOWAY, USED WITH PERMISSION.